Searching for the blue cranes, we come across a lion. 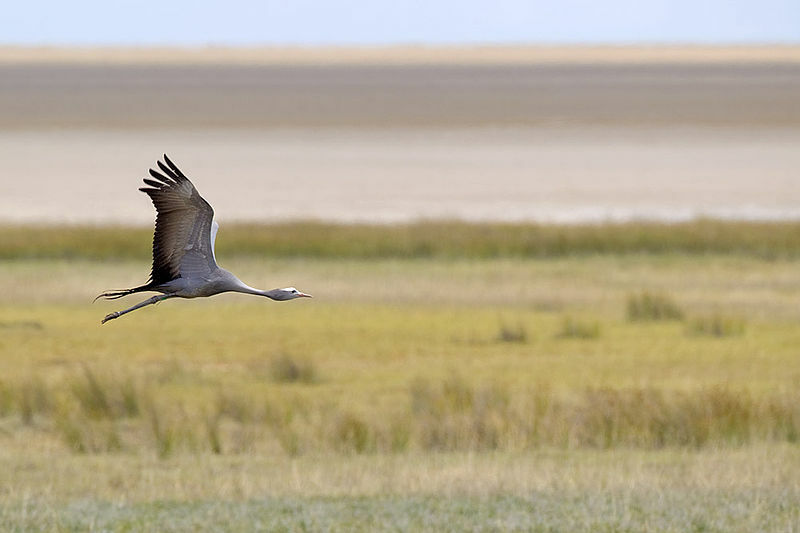 Blue cranes are endangered in Northern Namibia. There are just a handful of breeding pairs and researchers are working hard to save every single one of them. One crane of a breeding pair that roosts close to Okaukuejo was reported to have a piece of rope attached to one of its legs that was resulting in serious damage to that leg. It had to be removed, as it is one of the 12 known (and tracked) birds in the massive 5.5 million acre Etosha National Park. 1. Find roosting spot for the night. Simple? No. The birds are smart and roost in different places each night when not nesting. Roosting spots are chosen to be particularly difficult to access, because there is no shortage of ground predators (hyenas, lions and such). After several days of searching in vain, the researchers are running short of time to make a successful rescue. I was invited to join on one of their nightly missions because I expressed interest in seeing such an operation. 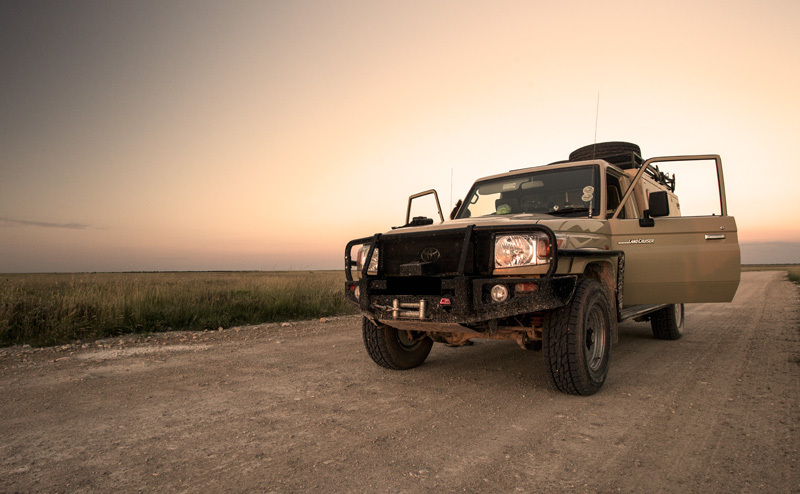 At dusk, two Landcruisers patrolled the area where the birds were likely to roost. With no sign of the birds and night approaching quickly, it looks like it is going to be another fruitless night. Just then, an eagle-eyed member of the park’s staff spots the troubled pair. Eagle-eyed he is! We struggle to see the birds with our overpriced Zeiss and Leica binoculars while Mr. Eagle Eyes is even telling us what the birds are doing. And people say that I have a good eye. Crazy. One Landcruiser stays put to watch the birds, while the other goes to the likely roosting spot. Night comes quickly, as it always does in the tropics. The birds trick us and fly in the exact opposite direction of where we want them to go. They drop beyond a small dune near the edge of the pan. We have a location for them, but it will be very tricky to get to them. We meet up with the other team and make a plan. We need to take a road that is not often used during the rainy season. We decide to travel in one car because we want to tread lightly. It is a Landcruiser bakkie (a single-cab pickup/truck) with seating only for two, so three of us hop into the back. We’re set. After a few kilometers in the darkness of a moonless night in Etosha, we arrive at our determined landmark. Until then, there was no animal to be seen. Suddenly, the searchlight catches a large body moving through the tall grass. Gemsbok? No. Great. It’s night, there are three of us in the open and the only animal we come across is a lion. Not a good time to get stuck in the clay now. The lion stops to look at us, but continues his determined walk to somewhere. We drive on a couple hundred or so meters in the direction of the birds (which we still hadn’t seen) and come into an area surrounded by small dunes on three sides. And then we hear the unmistakable sound of tires losing traction on soft soil. Poo! Not quite what was in the mind when we saw the lion, uh? We need to think quick. We cannot go forward as the soil is too soft for even people to walk on. The Landcruiser is all-powerful, but pretty much helpless in such terrain. We have to retreat, but we are now stuck. Quite deep too. We need stones and mats to put around the tires to help the wheels get some traction. We hop off the car, run around like mad men looking for rocks. Five minutes seemed like five hours (to me anyway). No one spoke about the lion, except for brief searchlight checks in the direction of the lion sighting. Somewhere beyond the reach of our lights, and uneasily close, was a lion. Perhaps more than one lion. We think there are enough rocks to free the car. We will get one chance to pull out. The powerful engine roared in the quiet night as it pulled its multi-ton body out of the soft clay. Phew. The car comes to a halt on more solid ground some fifty or so meters away. With only the headlights to guide us in the dark, the “ground crew” (who helped push the car to freedom) have to make a dash in the dark. Safe in the back of the bakkie once again, it is time to give up for this night. As we backtrack, we see nothing else until we reach the other Landcruiser. The researchers and staff would be trying again the following night, and the nights after until they succeed. Nights like this are the ones that make you respect the work of researchers. At least the good ones anyway. This is the crane we intended to catch. This is a photo from two years ago, when the crane was living a happier life. We wait for nightfall while tracking the movement of the blue cranes. And this beast is the almighty Toyota Landcruiser that is so well respected in Africa.